India’s New RE60 Car gets 82 Miles per Gallon. | Chaos Sweeps Away the World We Know! The Disaster, current events & Catastrophe Blog. Forecasts for 2014 to 2022. Read tomorrows news today! Plus current economic, commodities, stock indices and financial news. ← The Quadrantus Meteor Shower. India’s New RE60 Car gets 82 Miles per Gallon. 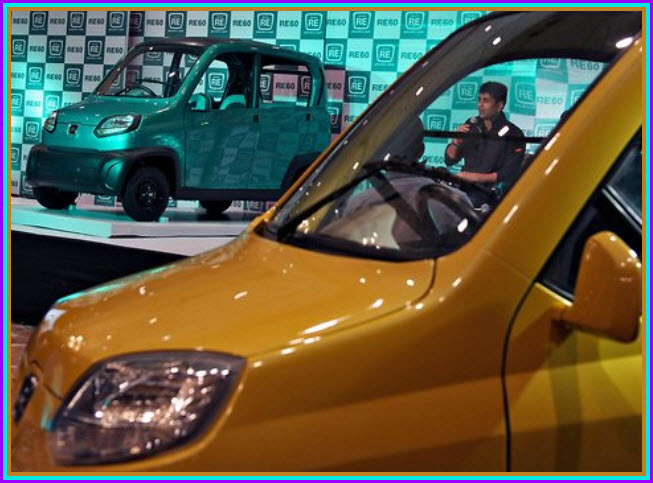 January 4, 2012 – India’s New RE60 Car gets 82 Miles per Gallon: Bajaj Auto Company introduced the RE60 small car, which gets 82 MPG and costs $2,750. The Indian Company is best known for making motorcycles. The RE60 offers features including seat belts, doors and a hard top. It will have windows, although ones that fold out rather than roll down. Executives from Bajaj suggested that their aim was to make the best vehicle possible and not stretch to produce an engineering marvel that might not be suited to real-life conditions. Bajaj said the RE60, fitted with a one-cylinder, 200 cc engine, would deliver 35 kilometers per liter, or 82 miles per gallon, and have a top speed of 70 kilometers per hour, or 43 miles per hour. The RE60 is the result of several years of work by the company, which has an agreement to make a small car for the Renault-Nissan Alliance. Mr. Bajaj told reporters that those companies would get to see the RE60 this week at the AutoExpo. This entry was posted in Economic, Economics, Events, India, Misc, Miscellaneous, News, Review and tagged Bajaj Auto Company of India introduced the RE60 car which gets 82 MPG and costs $2750, India's new RE60 car gets 82 miles per gallon, The Master of Disaster, the RE60 has a one-cylinder 200 cc engine. Bookmark the permalink. 1 Response to India’s New RE60 Car gets 82 Miles per Gallon. A scene simulator advertisement on the smartcar a few years back. I test drove the smartcar. Good handling/great mileage. Unfortunately import and export costs. Taxes, dealers handling and all of the markups that go along with selling cars here in America. Brought the costs up way beyond what the early advertisements said, what they would sell for. Let’s hope they bring this car to the states they can keep the price down.